We offer top-noth surfgear for beginners and advanced surfers. Surf’s up! Vieux Boucau has a beautiful beach with great waves and is a central point to other famous breaks in the area! It’s the perfect base camp for your surf trip! 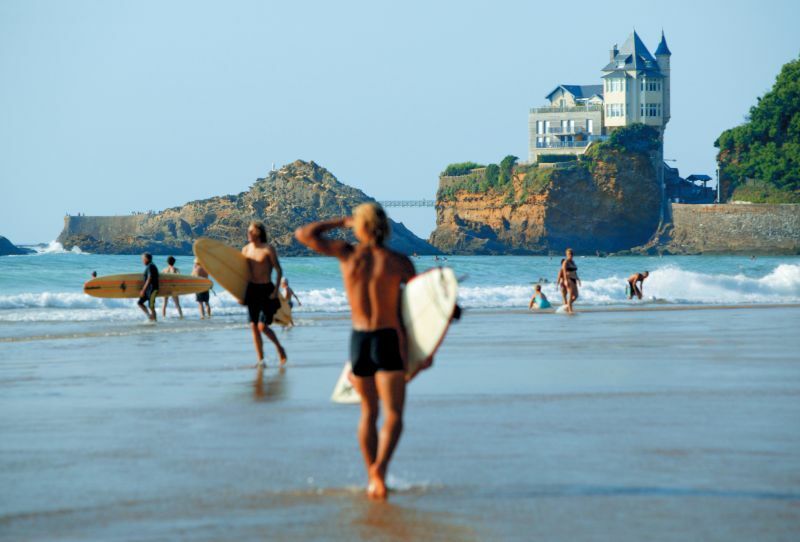 There’s a reason why the West coast of France is the cradle of European surfing! The endless beach breaks that run from Bordeaux to Hossegor offer countless great spots, while the cliffs that stretch from Biarritz provide tiny bays and great reef breaks. 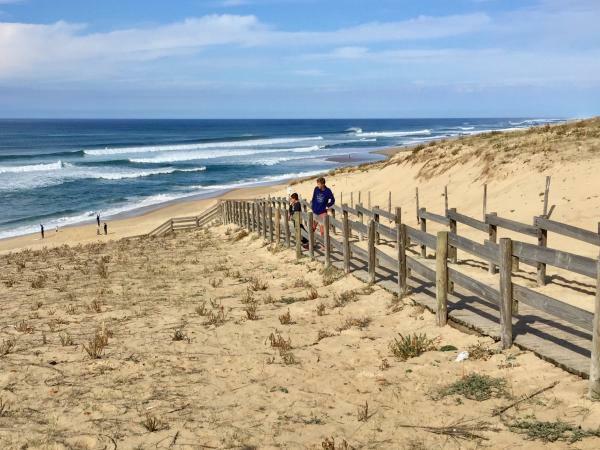 The estuary at the beautiful Vieux Boucau beach produces nice sandbanks, and Vieux Boucau is very centrally located for other popular surf spots. In short, it’s the perfect location for both beginners and professionals! Are you an absolute beginner, or a veteran surfer looking to pick up a few tricks? Either way, we have what you’re looking for! 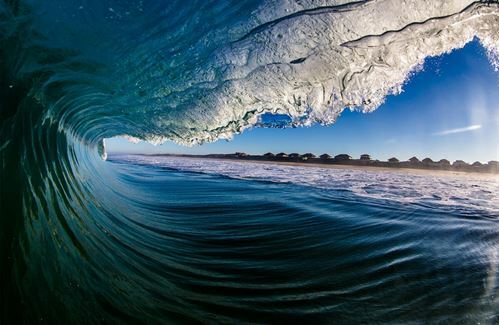 We offer several packages of surfing lessons that will help you improve quickly. We only work with certified instructors and high-quality surf gear. Not only will you learn the basics of surfing, but they’ll also teach you about safety, the beach, currents, waves, and surf gear! Your stay at the SURFinn always includes the free use of top-notch surf gear. The Board Room is packed with a range of great gear, and we also provide wetsuits to protect you from the cold. There are soft tops available in different sizes and shapes, and some Torq hard tops for the more experienced surfer. We include wetsuits by C-Skins. During the summer you can choose a shorty and during the colder months you can take a 4/3mm wetsuit. We have different sizes and suits for everyone! Are you an advanced surfer? We have some special boards waiting for you, available at €50 per week. These boards were made by famous shapers such as Al Merrick and are lighter and faster than the other boards we have –absolutely not suitable for beginners. Of course, if you prefer to bring your own board and/or wetsuit, that’s no problem. We include wetsuits by C-Skins. During the summer you can choose a shorty and during the colder months you can take a 4/3mm wetsuit. We have different sizes and suits for everyone! We’re happy to call this our home spot! The estuary always provides us with good banks and several peaks. Off-season it’s pretty calm in the water, but in the Summer the crowd evens out well too! Famous for its many surf camps during the Summer. The estuary here also creates good sandbanks sometimes, and this spot is definitely worth checking out. Our north-side neighbor. If the sandbank’s in the right spot, it’s really in the right spot! A quiet beach with a nice sea-side restaurant. Our neighbor: a nice, quiet beach, with waves that are the same! A short and sweet shorebreak that is definitely worth checking out if you’re looking for good spots! Just south of Penon, you may find a few peaks that work during different tides and create a perfect combo with Penon itself! One of the most popular beaches around. It has a wide setup with several peaks, so you’ll always find a wave that suits you. Definitely suitable for longboarders! Tip: have lunch or dinner at Le Surf bar, right at the Estagnots parking lot! An iconic surf spot because of the annual Quicksilver Pro contest! There’s a reason for that: the sandbanks are often very well positioned. This is a monstrous shorebreak. Fast, and with enough power to snap boards in half. A lot of fun to watch, and even better if you have the skills to ride it! Right in front of the bars that fill the boulevard, there’s a big wave spot! Fairly accessible, but keep in mind it’s a serious wave! An easy wave that’s located just south of La Nord. 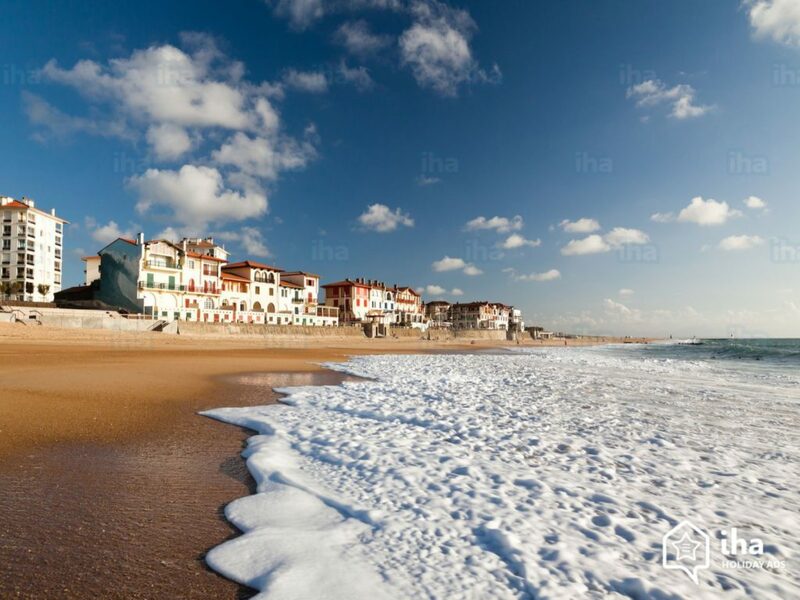 Perfect if you want to combine a Hossegor visit with some laid-back surfing! Tip: Check out the outlet shops at Soorts (Zi Pedebert )! This beginners’ wave is well protected from the winds. It’s the nearest spot to check when other waves are blown out. Right in front of the boulevard and the plenty bars and food joints. A beautiful right-hander that starts at the dike. Lots of locals here, and always crowded on good days. Right at the beach that’s famous for both its bunkers and its great waves. This is our favorite in Hossegor and Capbreton! This is not a beginners’ wave! The break is fast, hollow, and powerful and very popular among skilled bodyboarders. 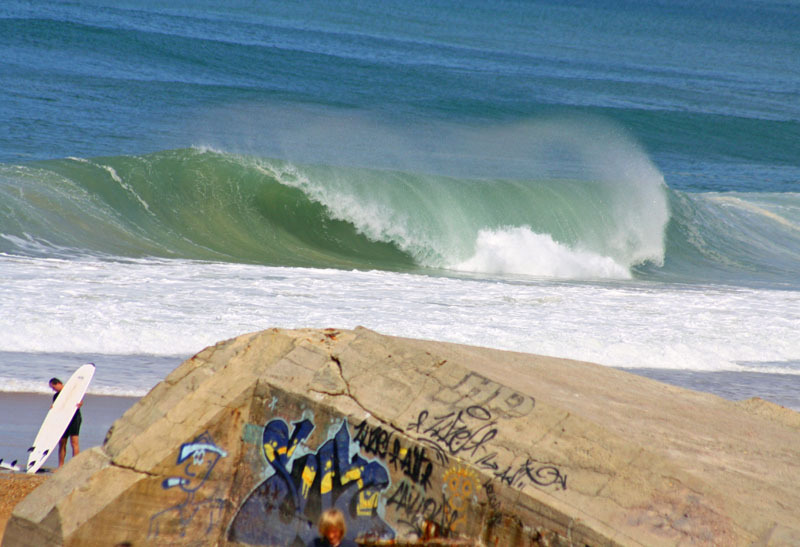 A legendary surf spot that’s trapped between two longitudinal dikes. It works during storms and has a heavy shorebreak when it’s big. It also features the only McDonald’s with a surf spot view. This spot consists of several car parks (Cavaliers, Marinella, Chambre d’Amour), lots of peaks and tons of good waves. The further south you go, the heavier the crowds get. That’s where you’ll find the bars and surf shops. A surf spot in the middle of town. Park in the garage, where you slip into your wetsuit, and hop into the ocean. Always crowded, always fun! A beautiful setup that features the famous little castle and the ocean-view bars. This place is home to lots of contests and several peaks. Be careful at high tide: getting out of the water might be a challenge! Tip: Just north of La Côte Basque, you will find an excellent ocean-side tapas and wine bar! A beautiful reef break with long right-handers. Often crowded (especially during lunch!) but always worth the trip. Volume is your best friend here! 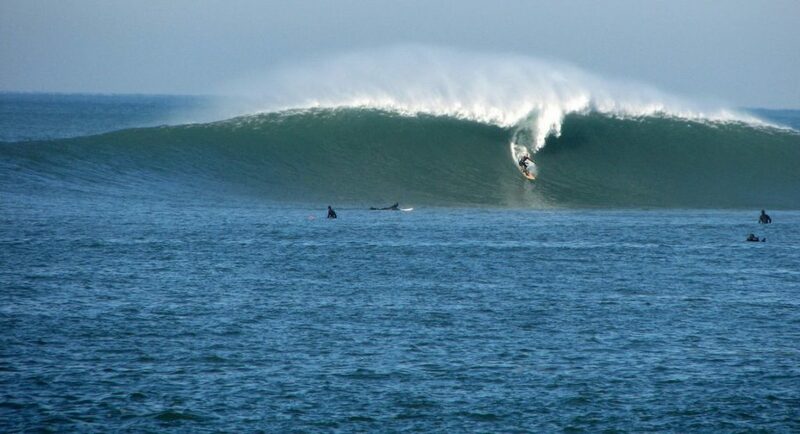 Big wave spot, experts only! It’s always more powerful, bigger and better than you thought. Respect the locals! Guethary is also a great place to visit: a nice little village that’s built on the cliffs, with some good restaurants. If all else fails due to wave size or heavy winds, this is the place to go to. As it’s located in a bay, you’ll find surfable waves here even in the worst conditions. It never gets really good, but we’ve had some very enjoyable sessions here on days like that. The town has lots of restaurants and bars and is right on the Spanish border!